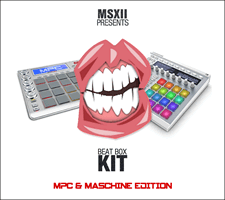 In another amazing MPC-Samples.com exclusive, we're proud to present The BeatBox Kit - MPC & Maschine Enhanced Edition. This is truly a one-of-a-kind MPC & Maschine powerhouse, with 40 original human beat box loops from MSXII Audio coupled with a fully multisampled, velocity switching human beat box finger drumming kit for creating your own realistic beat boxing performances in MPCs and NI Maschine! Using the same programming techniques found in our multisampled acoustic drum kits, the beatbox kit features dozens of multisampled human beat box sounds mapped out across your pads and fully configured for velocity-sensitive sample switching. This technique produces a more life-like and organic sounding kit that will play back a different timbre samples depending on how hard you strike the pad, allowing you to effortlessly play, finger drum or sequence your own incredibly realistic sounding human beat boxing performances! Check out the demo to hear how this collection can be used in a full production (non-beat boxing sounds used in the demo are not included in this pack). To accompany the multisampled kit, you'll also get the fantastic 40 beatbox loops found in the original 'Beat Box Kit' sample pack from MSXII Audio, which cover tempos of 85 bpm, 92 bpm, 135 bpm and 141 bpm, all recorded through a Neuman TLM 102 Microphone for a cool and classy saturated tone. Don't sleep on the one of the most unique drum kits around - made for MPCs and Maschine and available exclusively from MPC-Samples.com! Is this no longer available? The link takes you to the 70s kit. Might be fun to get a cheap mic and experiment. Or just cheat and sample some of that old school stuff.